The main figure --a screaming soldier seen in three-quarter view, facing right, is usually thought to represent Niccolò Piccinino, the condottiere in command of the Milanese troops of the Duke Filippo Maria Visconti, who were defeated by the Florentines in the battle of Anghiari. The profile is a study for one of the soldiers to his right. The lack of definition of the upper part of both heads probably relates to the fact that in the final design the figures would have been portrayed with headgear. 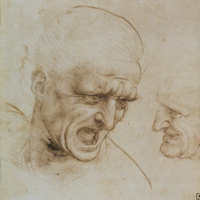 Leonardo da Vinci (Italian artist, 1452-1519), “Studies of the Heads of Shouting Warriors for the Battle of Anghiari,” Institute Images Online, accessed April 24, 2019, http://westerncivart.com/items/show/2961.